These socks were such a pleasure to knit up! It's the first time I've knit a sock with cotton in it. Regia Cotton Surf. They come in big 100g balls and I have about 7 grams leftover. The yarn has about 40% wool in it which gives it a nice resiliency and stretch, but the cotton makes it lighter weight and less warm -- perfect for in between season wearings. 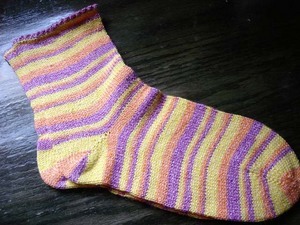 When I started sock 1, I purposely cast on starting at the very beginning of an orange color change. At this point I didn't know what the stripe repeats looked like, so I just pulled the yarn out until the first color change. I knit up sock 1 without any concern over how the stripes were laying out. But, After several inches it was clear that the yarn had a 9-stripe repeat. Every 9 stripes started over with the same color and width sequence. It's important to note that not all sock yarns are so predictable. Here's a pic of the socks side-by-side. Can you see the 9-stripe repeat? Honestly, I didn't expect the socks would match up as well as they did! The Cotton Surf is VERY consistent and that made all the difference. Consistent gauge helps too, but if the yarn didn't repeat so well it wouldn't have mattered. You may have noticed in last week's pic that there was a ridge along the center of the sock. This was where the 2 circs met. I had never had that happen on wool socks before and I wasn't sure if it would relax. But it did! If you look at the top pic it's completely gone. I did end up pulling out the first hem. I went with Marnie's suggestion of Kitchnering it. There's a great illustration in Montse Stanley's book on how to Kitchner a hem in place. It's similar to kitchnering garter stitch. I was S-L-O-W but it worked -- took about 1.5 hours per sock! And it's as stretchy as the rest of the sock. Just a regular old toe-up with short row heel. I used a figure 8 toe with no slip knot so I could go back and pull it tighter once I had knit a few inches. I made the sock 10% smaller in width than my sock pal's foot, and I reduced the leg by 8 stitches about an inch above the heel because it seemed too wide for sock legs. I did a basic YO K2tog picot edge, followed with 4 or 5 rows of stockinette, and then the Kitchner hem. Very nice! They're so springy! I love the spring colors... it gives me hope that all this snow WILL go away! I must try a picot edge now that I've seen how great yours came out! What fun spring colors! I'm curious about the picot edging. I've always done a rib because I'm afraid a picot edge would not stay on my leg as well. But I love the look of it! Ah, thanks for the satisfying blow-by-blow. Very helpful for those of us who haven't made many. Those socks are really special - I love that you matched them so well. There's a really good explanation for the hem at the top in Nancy Bush's Folk Socks, too - I had to do it on my Latvian Sock - I was scared, but it worked out! Very pretty edging. I've avoided the two circs method because I get ladders. But if washing the sock really gets rid of them maybe I should try it again. I am off to Philadelphia for the day on Sunday to spend the day with an old college friend. Planning to stop at Rosie's and to visit Sophie's. I am writing to ask if you could recommend a spot for two old friends to sit, eat, drink and chat for a while. Sweet socks; I really love the colorway you chose. Do you recommend any resources for learning socks on two circulars? What's your opinion about two socks on two circulars? Thanks for all of your sharing, it's really interesting and helpful. Yes, these socks are special - because they are on my feet right now! Oh I love them so much thank you!!! The funny thing about it all? I was going to ask you where you got the yarn for these at the next Philly Knitters S&B, because I wanted to make a pair myself. Now I don't have to! I don't have a camera or I would send you a photo of the scarf I made using your "Nashville Scarf" pattern. I knit the scarf with Malabrigo yarn in Polar Morn, cast on 32 stitches and used size 9 needles and it turned out lovely. The Nashville scarf was my first knitted project after 40 plus years of no knitting. Thanks to your pattern it was a big success.